From Gucci's G-Timeless collection, this Swiss Made timepiece is an enticing accessory perfect for the modern professional woman. 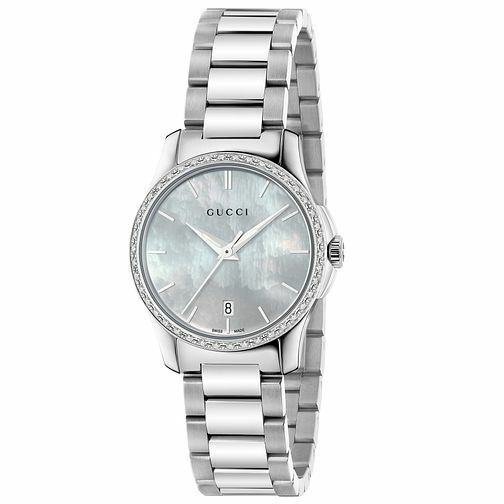 With a minimalistic mother of pearl branded dial beautifully complementing the stainless steel casing and bracelet, this stylish watch is designed to make a statement. Gucci G-Timeless Stainless Steel Bracelet Watch is rated 5.0 out of 5 by 2. Rated 5 out of 5 by Anonymous from Sparkly Very beautiful, elegant, dateless, outstanding quality watch. Rated 5 out of 5 by Anonymous from Timeless Gucci I purchased this model as is a timeless classic by Gucci that can be worn everyday, and still feel special. The fit is much loser and can appear more masculine than other models, so do bear this in mind that it may fall slightly forwards over the wrist bone, even with link removal. Still love it just the same as the face and diamonds compliment and sparkle, lots of positive compliments when worn.